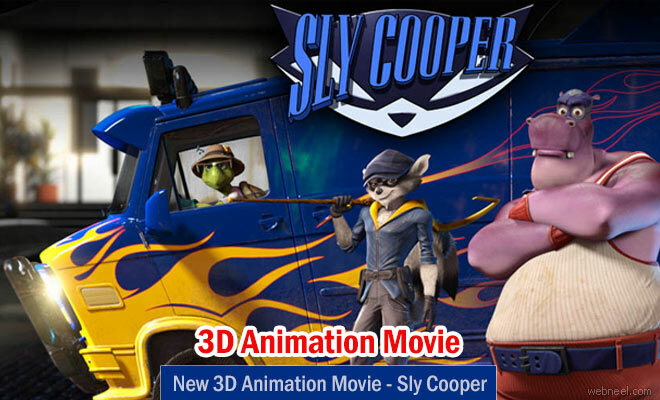 Sly Cooper is 3D animation movie by Rainmaker Entertainment and Blockade entertainment which is based on the video game under the same name. According to imdb, "A kinetic and comedic heist film that tells the story of Sly Cooper - an orphaned raccoon Thief, along with his childhood friends and partners in crime, Bentley Turtle and Murray Hippo Happily living la vita dolce as a small-time thief, Sly learns of his birth family's secret legacy - that he comes from a long line of talented and international Robin Hood-like heroes. Endowed with this knowledge, Sly and his friends are catapulted into a global adventure as they race to reassemble pieces of an ancient book holding The Cooper Clan's family secrets before it can fall into the hands of Clockwerk - an evil Russian metallic owl bent on ending the Cooper family line. From romantic Parisian backdrops to the lush mountains of China, gritty film noir meets bright, colorful graphic novels in this origin story of the world's greatest thief-turned-hero". Voice cast for the movie are Ian James Corlett as Sly Cooper, Matt Olsen as Bentley, Chris Murphy as Murray. It's produced by Brad Foxhoven.